SLOWDOWN or not, there are still multi-million ringgit deals to be made and last year saw its fair share of real estate transactions of above RM10 million each. From residential high-end bungalows to prime development lands, from office buildings to heritage shophouses and factory units, there was definitely something for every buyer with deep pockets. Kuala Lumpur last year were the sale of the 33,505 sq m Wisma SDB in Jalan Ampang by Selangor Dredging Bhd for RM480 million; and a 29,977 sq m freehold commercial development plot along Jalan Raja Chulan that transacted for RM516.27 million. Over in Selangor, a freehold 54,870 sq m commercial lot in Bandar Setia Alam transacted at RM147.6 million while Aeon Mahkota Cheras Shopping Centre with a built-up size of 34,242 sq m was sold for RM87.8 million. There were also significant development plots that changed hands including a freehold 75,737 sq m commercial land in Cyberjaya, which fetched RM128 million and a 264,400 sq m commercial tract located at Off Jalan Batu Arang in Rawang that sold for RM85.3 million. Meanwhile in Penang, two development land deals in Bandar Cassia, Batu Kawan in Seberang Perai were among the biggest land deals in the state last year. The largest was a leasehold commercial land of 1.2 million sq m that went for RM681.9 million while a smaller 301,455 sq m tract was transacted at RM143.2 million. Another significant deal was a 648ha freehold oil palm estate in North Seberang Perai, which transacted at RM589 million. Here is a breakdown of some of the top deals by value that were concluded in 2017 in Kuala Lumpur, Selangor and Penang. A total of 105 real estate deals of above RM10 million were transacted in Selangor in 2017. A freehold 54,870 sq m vacant plot in Bandar Setia Alam that transacted at RM147.6 million. This was also the biggest real estate sale in Selangor last year. The sale of Aeon Mahkota Cheras Shopping Centre for RM87.8 million. The seven-year-old freehold 2-storey shopping mall has a built-up size of 34,242 sq m.
A 10,117 sq m freehold vacant plot also in Bandar Setia Alam that was sold for RM41.3 million. Another 7,336 sq m freehold vacant lot in Setia Alam was transacted at RM22.1 million. RM11 million. Built on a 455 sq m lot, it has a built-up of 2,678 sq m.
Also transacted was a petrol station located on a 10,546 sq m freehold plot at Jalan Lingkaran Tengah 2 that sold for RM25 million. In the residential segment, there were only five transactions of above RM10 million and all five were residential lots. The highest-priced transaction was an 84,130 sq m tract in Puncak Alam that sold for RM40.7 million. A leasehold 274,413 sq m vacant plot in Pulau Indah Industrial Park that sold for RM112 million. A leasehold detached factory unit in Seksyen 23, Shah Alam which changed hands for RM91.5 million. A leasehold detached factory unit in Seksyen 3, Kota Damansara that was sold for RM50 million. A piece of freehold 75,737 sq m commercial land in Cyberjaya, which fetched RM128 million. A 264,400 sq m commercial tract located at Off Jalan Batu Arang in Rawang that sold for RM85.3 million. A leasehold 32,280 sq m commercial tract in Taman Lestari Perdana which was transacted at RM63 million. A total of 44 real estate transactions of above RM10 million were concluded in KL in 2017. Of these, six were residential, 13 were commercial, one was industrial and the remaining 24 were development parcels. A freehold three-storey detached house in the high-end Damansara Heights area with a land area of 1,816 sq m and built-up of 2,016 sq m. It was sold for RM20.6 million. A leasehold 2-storey detached house in Taman Tun Dr Ismail, with a built-up size of 2,724 sq m and land area of 5,042 sq m that transacted at RM19.46 million. A freehold 1,956 sq m residential lot in Seri Beringin, also in Damansara Heights, sold for RM14.81 million. Out of the six over RM10 million deals, three of the residential properties are located in Damansara Heights. Other notable deals included a 2-storey leasehold bungalow in Raja Mohar scheme, with a land area of 1,264 sq m and built-up of 1,036 sq m, sold for RM11 million and a 2-storey freehold 916 sq m bungalow in Kenny Hills, which was built on a 1,395 sq m tract, transacted at RM11.5 million. Wisma SDB, a purpose-built office with built-up space of 33,505 sq m tops the list at RM480 million. It was sold by Selangor Dredging Bhd (SDB) to Golden Eagle Realty Sdn Bhd last June. A 13,833 sq m freehold commercial plot on Jalan Tun Razak which was transacted at RM467 million. A 4,074 sq m leasehold tract also on Jalan Tun Razak that was sold at RM180 million by Malaysian Resources Corp Bhd (MRCB) to Mass Rapid Transit Corp Sdn Bhd (MRT Corp). The site was previously meant for a proposed development called The Grid. Another notable commercial property deal was a freehold purpose built-office in Damansara Heights with a built-up of 8,762 sq m that was sold at RM65 million. Also transacted was a retail unit in Taragon Puteri KL, with a built-up size of 1,235 sq m for RM12 million. A 29,977 sq m freehold commercial land along Jalan Raja Chulan that sold for RM516.27 million. A 274,430 sq m freehold commercial land in Jalan Cheras that went for RM300 million. A freehold 18,332 sq m commercial tract at Kampung Attap or Maharajalela sold at RM165 million. A total of 22 real estate deals of above RM10 million were concluded last year in Penang. Eight of them were development land transactions while seven were agricultural land deals. Commercial and industrial recorded three deals each; while the residential segment saw only one property sold at above RM10 million. 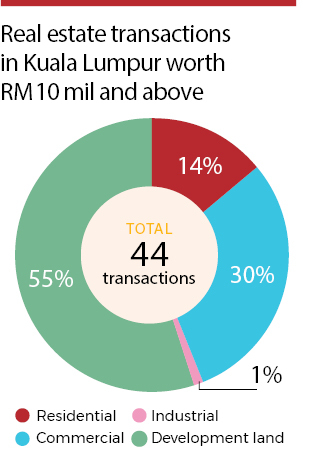 The residential segment recorded only one transaction of above RM10 million last year. It was a freehold 3½-storey terraced house in Bandar Seri Tanjung Pinang, which sold for RM12 million. It has a built-up of 1,151 sq m.
A 4½-storey shopoffice in Nova Place which was sold for RM15.2 million, making it Penang island’s largest commercial property transaction last year. This freehold unit is on a 828 sq m plot and has a built-up of 1,410 sq m.
A freehold pre-war double-storey terraced shophouse in Lebuh Chulia, George Town, which has a land area of 1,578 sq m, was transacted for RM14.8 million. Another freehold double-storey pre-war shophouse which has a land area of 1,232 sq m, in Jalan Clove Hall, George Town, was sold for RM11.57 million. A RM21.5 million factory in PDC Industrial Park, southwest Penang, with a land area of 8,061 sq m and built-up size of 4,966 sq m.
A detached factory in the same area on an 8,162 sq m site with a built-up of 2,308 sq m, sold for RM17.5 million. A detached factory in Bukit Minyak Industrial Park, Seberang Perai Tengah, which sold for RM11 million in August last year. The 1,402 sq m factory was built on a 6,072 sq m site. A leasehold 1.2 million sq m commercial land in Bandar Cassia, Batu Kawan which was transacted at RM681.9 million. Another leasehold commercial site in Bandar Cassia with a size of 301,455 sq m sold at RM143.2 million. A freehold 87,388 sq m commercial land on Jalan Kerian Kedah, Seberang Perai South, sold for RM16.9 million. There were seven agricultural land deals that were transacted at over RM10 million. The deal with the highest value was a 648ha freehold oil palm estate in North Seberang Perai, which was sold for RM589 million. Other notable agricultural land deals include a 15ha freehold vacant plot located at Off Jalan Junjung in South Seberang Perai, which changed hands for RM27.47 million, and a 9ha freehold land at Off Jalan Kulim in Central Seberang Perai, which sold for RM15.11 million. This story first appeared in the EdgeProp.my pullout on June 29, 2018. Download EdgeProp.my pullout here for free.